Shekinah Nite, Christmas edition holds on Saturday, 10th of December. 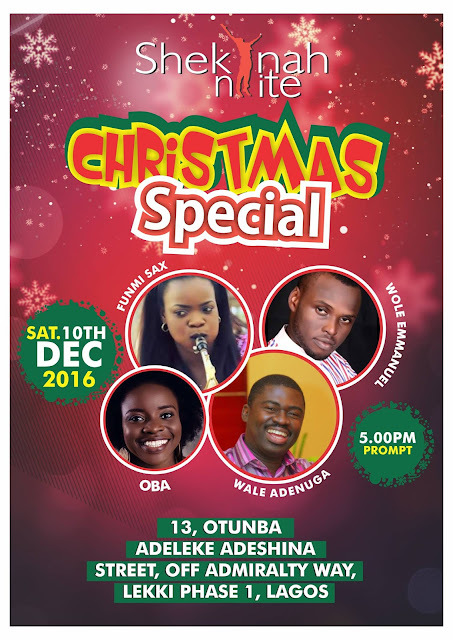 As we draw the curtain on Shekinah Nite for the year, it is our pleasure to invite you along with your family and friends to attend and participate in the Christmas Special event which will hold on Saturday the 10th day of December 2016 at #13, Otunba Adeleke Adeshina Street, Lekki, Phase 1 from 5:00pm. In this special event, it is our pleasure to have in the house, our brother, friend and devout servant of the Most High God, Wale Adenuga, who as well as being a pastor of the Word, is the composer of notable church songs that include: ‘Today’, ‘Hosanna’ and others. Also ministering at the event is our very own Funmi Sax, who returns from an amazing experience in London where she ministered at the Festival of Life. Funmi has over the years evolved into a competent and fully anointed worshipper and saxophonist. The third member of our quartet for the day is OBA who is an accomplished Jazz musician, composer, and worshipper. She leads her very professional band to the event. The final piece of the musical cocktail is provided by Wole Emmanuel who is also a minister of the gospel and a no-holds- barred worshipper and God chaser. Our special guest for the event is Pastor Chris Ogali who outside of being the original vision bearer for Shekinah Nite, is the provincial pastor in charge of the RCCG overseeing Mainland Florida and the Caribbean Islands. May we therefore anticipate your kind attendance at this entirely free family friendly event with culinary delights thrown in. The venue is easily accessed from the Lekki/Ikoyi Bridge or the Lekki/ Épe Expressway at the first roundabout. From either, it is a straight drive down Admiralty Way past Prince Ebeano Supermarket and Tantalizers with a left turn at the 21st Century Junction into Babatunde Anjous, a first right thereafter into Jeremiah Ugwu and then a second left into Otunba Adeleke Adeshina Street. If you would rather, the option of comfortable transportation to and from the venue is provided at 4:30pm from our previous venue at 252, Murtala Muhammed Way, Yaba on the Mainland.